The process of applying to universities has gone completely digital. Bygone are the days of college hopefuls waiting anxiously for big postal envelopes to arrive at the door — admission letters have been replaced with more immediately gratifying electronic mail. Fall’s incoming freshman class relies on digital transcripts and test scores and emailed letters of recommendation to apply for college, even video clips showing athletic and academic achievements allow admissions officers to virtually meet applicants. Financial aid and scholarship forms are found online. And the extra stuff, minutia such as dorm food quality and campus clubs can be found in the digital world, including peer ratings for professors or even hottest teacher rankings. With so much information online, students today may be better prepared for college life than ever before. But, does the evolution to an online-only application create barriers for some students, such as those living in the nearly 16% of internet-free households in Long Beach? College admissions officials and counselors said that’s possible, but they argue the benefits of a digital system far outweigh that risk, and they are constantly working to make online applications as user-friendly as possible. Cal State Long Beach Director of Admissions Andrew Wright is a proponent for online applications, and he is quick to point out that digital has been the standard across the 23-campus CSU system since the 1990s, with constant upgrades ever since. CSU is the largest system of higher education in the country. And while he does concede that some students might find online applications challenging, it’s probably easier than ever before, and Wright said the application is specifically designed to offer guidance along the way and reduce the likelihood of mistakes. CSULB student Evelyn Celina Delgado Cruz, 23, was one of those applicants who didn’t have internet access or a computer at home that she could use when she applied for college. Because of that, she used a smartphone to submit her application for the fall semester of 2012. She said the application process was a stressful one, not because of the tiny phone screen she used — but mostly because of the difficulty that came from age-old issues such as waiting until the last minute to apply and struggling to gather all the personal information she needed in time. In fact, she said using her phone to apply for school felt natural and only took about an hour to complete. She noted that she still does not have internet at home because it is too expensive, but she does own a computer. She’s still working towards completing her degree. Catering to mobile-access only applicants such as Delgado Cruz, the CSU system launched the latest mobile-friendly version of its online application this fall, making the process even more streamlined for students seeking enrollment in the winter of 2018 and fall of 2018, Wright said. Those applying can expect to be up against an average of 60,000 other freshman applicants for CSULB — of that number, only about 10,000 will be accepted, Wright said. System-wide, the CSUs process about 1.1 million applications annually. It’s a competitive process, and one that he said the university works hard to make as fair and easy to use as possible. Outside of the CSU system, the story is much the same, according to Ralph Becker, college counselor and owner of Ivy College Prep, LLC. Becker lives in Long Beach and regularly pens articles on Gazettes.com with expert advice about applying for schools. “Paper in the admissions world is dead,” he said. And basically, good riddance, he added, because there’s such a wealth of information available for students to find online today. The only challenge, he said, is sometimes navigating that vast ocean, especially for applicants who might not be as computer literate as their peers. Before the internet, he added, paper applications had to be handwritten in ink or typed, packed together and mailed with appropriate postage. Financial aid applications had to be submitted the same way. And, getting information about schools was tougher without a physical visit. Although he doesn’t recommend using a smartphone — unless it’s the only option available — Becker said he believes online applications have decreased the number of barriers to applicants, evening out the playing field for all students, including international ones. For most students, the application process is their first real interaction with any university, and that leaves a first impression — an impression that Wright and others at CSU want to be a positive one. All applicants need to apply is a valid email address, he said, noting that the new system has made it easier for students to submit test scores to multiple campuses within the CSU system at the same time, among other improvements. One of the first to test out the new CSU application system as she pursued enrollment for next fall was McBride High School senior Marisol Martinez, 17. 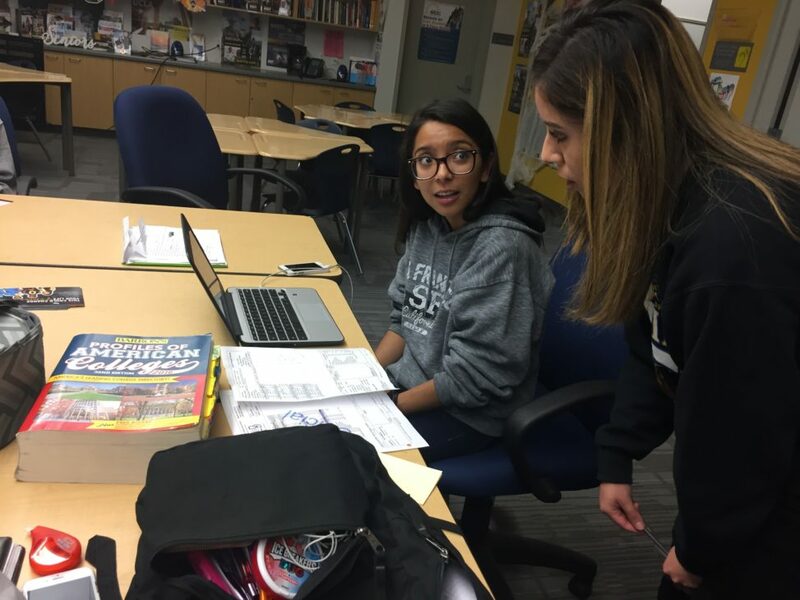 Martinez sought guidance from the counselors available at her high school’s College and Career Center, where she digitally submitted applications to multiple universities using one of McBride’s Chromebook laptops available for student use. She made steady progress through the application in a matter of minutes. The most difficult part, she said, wasn’t online — it was overcoming an issue with her transcripts transferring from a high school she attended in San Diego before moving to Long Beach. It takes the average freshman applicant 25 minutes to apply, and that time may be faster with the new application system, Wright noted. On the back end, centralized processing of the applications and a smaller paper trail keeps costs down, he added. Plus, the system is more failsafe than old-fashioned mail-in applications since students receive an immediate notification that their application has been received. Those lucky enough to earn a congratulatory email will be welcomed into a modern and technologically advanced university, Wright said, where they’ll have to continue working in both the digital and physical world in order to succeed.